Today marks the launch of 500 Women in Medicine, a satellite of 500 Women Scientists established by five women medical students. Celebrate by getting to know the five women running this initiative. We believe women play a critical role in medicine and for medicine to truly serve the people, it must be inclusive and reflect the true diversity in our society. To learn more, check out their official page and follow them on Twitter @500WIM, Instagram @500womeninmedicine, and Linkedin. How did you five meet? What areas of medicine do you work in? I am in my 3rd year of medical school at WashU, and I am planning on pursuing a career in orthopedic surgery. Maren and I met in the first month of medical school at WashU at a women’s leadership conference. From that day on we became fast friends and partners on numerous projects and initiatives promoting gender equity in medicine. I first met Jane and Iris through our shared interest in surgery. I first met Tamara through mutual friends at WashU. Although the 5 of us have different backgrounds and are in different years of medical school we all have tremendous passion for promoting gender equity in medicine. You have recently launched a satellite organization as part of 500 Women Scientists — 500 Women in Medicine (500WIM). What inspired you to take action and create a community for women in medicine? Through my research studying gender equity in surgery I found a unifying theme: networks and visibility matter in promoting equity. On Twitter, I posed the question: “How can we as a medical community dispel the myth that ‘there aren’t any qualified women to speak’ as conference speakers and media sources?” A Twitter follower replied with a link the 500 Women Scientists website as an example of what efforts were ongoing in STEM fields to address this issue. I was incredibly inspired by what 500WS was doing with their Request a Woman Scientist database and vast network of community pods across the world. I saw an opportunity to incorporate women in medicine into their impactful platform, and I came to the 500WS leadership my idea to drive even more change for women in medicine. My hope is that through creating community and a platform for women in medicine we can expand the networks and visibility of women in medicine. What is your vision for 500WIM? What are your future plans? Our vision for 500WIM is to amplify the ongoing efforts of 500WS by expanding their reach into the domain of medicine. I want women in medicine to feel welcome and supported in the 500WS community. Additionally, I hope that 500WIM can increase the visibility of women in medicine through integrating medical disciplines into the existing “Request a Woman Scientist” database. The goal is to create a public resource tailored to the healthcare industry which will enable conference organizers, journalists, researchers, and medical professionals to quickly and easily lookup women physicians and scientists. When you're not working in medicine, what do you do to unwind? I’m a huge sports fan (Go Dawgs!) so I love to spend my weekends watching football and basketball. When I’m not watching a game, I enjoy hiking and being outdoors in Forest Park. Growing up in Seattle, I developed a love of coffee, so I also enjoy exploring new coffee shops around the St. Louis area. 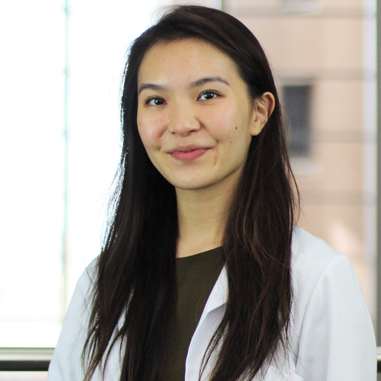 Jane is a second year medical student at Washington University in St. Louis School of Medicine. She graduated from the University of Texas at Austin with a BA in Theatre & Dance. Jane is a licensed paramedic and her research focuses on prehospital trauma medicine. She is also passionate about public policy and is involved with the American Medical Association and Stop the Bleed St. Louis. What inspired you to take action and create a community for women in medicine? I am looking forward to expanding the database of 500 WIM. My hope is that the database becomes an easily accessible and well-known resource for the medical community and public to access speakers for events. I am hopeful to see the number of women speaking at major conferences and programs increase to better reflect the number of well-qualified female experts in the field. When you're not working in medicine, what do you all do to unwind? I love spending time with my family. We like trying new restaurants and traveling together. I also like to crochet blankets for my friends and family. Since starting medical school, I've already witnessed and benefitted from countless instances of women in medicine helping other women in medicine. There's such a willingness to mentor, amplify, and celebrate other women that it seemed natural to make this platform a community-building one. The database component arose from the desire to make it extraordinarily simple for anyone to find experts in a certain field of medicine. My hope is that women at all stages will benefit from 500WIM. Some women will be presented with more opportunities facilitated by the database, some will find mentors and role models through the site, and the worldwide community of women physicians as a whole will become closer. I like to make time for music (playing and listening), photography, trying new recipes, phone calls with my sister and parents, relaxing with friends, and petting as many dogs as possible! I was really excited when Kate first described this idea to me. I had read an article in the Atlantic about a reporter self-assessing his bias by examining the percent of his sources who were women. The results surprised him, and he started actively looking for women who were experts in their field to use as sources. I think that by creating a database of women in medicine, to supplement the existing database of women in science, we are making it easier for women's voices to be cited and amplified. Recent studies have shown that patients of women doctors and surgeons have just as good, if not better, outcomes in comparison to patients of men doctors and surgeons. By making expert voices easily accessible to media, and by building on the success of recent social media campaigns like #ILookLikeASurgeon, 500 Women in Medicine will increase visibility of women in medicine and advocate for gender and health equity. I spend most of my free time being active or baking! I love running, biking, swimming, and hiking. I played volleyball in college, so I try to play regularly, and I was a volunteer assistant coach at WashU this fall. I also have a stack of books I'm hoping to read before spring semester starts. Tamara is a second year medical student at Washington University in St. Louis School of Medicine. She graduated from New York University Abu Dhabi with a BS in Biology. Her research interests are in public health, and she is passionate about public policy, education, and diversity and inclusion efforts. Tamara is involved with the Latino Medical Student Association and the Student National Medical Association. Last year at one of our local-chapter AMWA meetings, Dr. Robyn Klein, a physician-scientist at our very own institution, presented her data on gender bias at scientific conferences. I was absolutely appalled by the staggering inequalities. In an era where we can use technology at to help us stay informed and facilitate connections, I thought it was unacceptable to use excuses claiming that there are no known women experts to invite to conferences. Kate then introduced our team to 500 Women Scientists, and though we praised their efforts to increase the visibility and support for women in STEM, we were disappointed by the dearth of women physicians involved. We thus wanted to develop a medicine-focused platform that would be more engaging and useful to doctors and simultaneously further expand and strengthen the existing 500WS community. I love being active and spending time outdoors. I play on two soccer teams (one team is through a city-wide league and the other is through our school's intramural program), go for runs and bike rides in Forest Park, swim, and occasionally go hiking at one of the nearby state parks like Castlewood.